On September 16, 2017, about 0855 eastern daylight time, a Beech 35, N3187V, was substantially damaged while ditching in the Gulf of Mexico, following a total loss of engine power about 10 miles west of Marathon, Florida. The private pilot and passenger were not injured. The personal flight was operated by the private pilot and conducted under the provisions of Title 14 Code of Federal Regulations Part 91. Visual meteorological conditions prevailed and no flight plan was filed for the flight that originated from Fort Lauderdale Executive Airport (FXE), Fort Lauderdale, Florida, about 0745. The pilot reported that he and a business partner planned to survey damage to his business partner's home on No Name Key, Florida. They flew to the home, circled it at a low altitude, took photographs, and began a climb back to cruise altitude for the return to FXE. About 800 to 1,000 ft above mean sea level, the airplane experienced a total loss of engine power. The pilot prepared to ditch as the airplane would not glide far enough to reach land. He also attempted two engine restarts with no success, and reported the emergency to air traffic control. The pilot attempted two more engine restarts using the wobble fuel pump and electric fuel pump. He then attempted another restart using the electric fuel pump with no success. The pilot added that the propeller continued to windmill during the restart attempts. The pilot landed on the water with the landing gear and flaps retracted. The airplane came to rest upright and both occupants were rescued by law enforcement personnel. According to the president of a recovery company, the airplane was recovered 12 days later, on September 28, 2017. The airplane appeared to be intact and was resting on a sandy bottom. 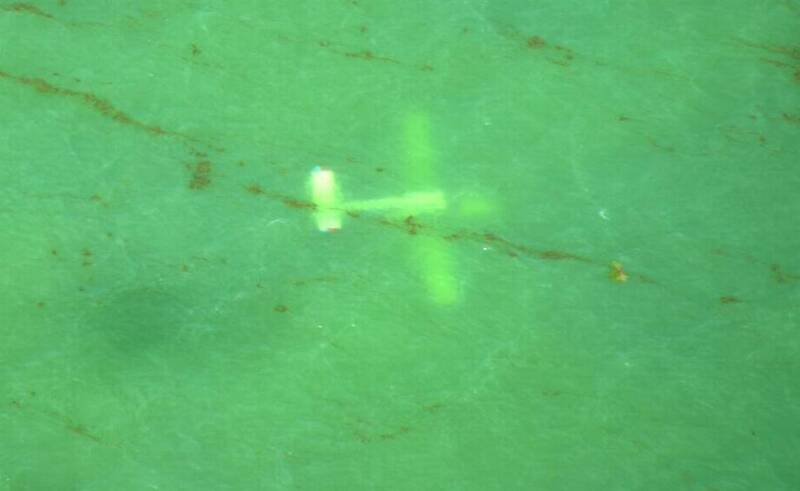 When the airplane was floated to the surface of the water, a fuel sheen was observed on the water surface. Following recovery, no fuel or water was noted in the left wing fuel tank and approximately 1 gallon of a fuel and water mixture was recovered from the right wing fuel tank. The president of the recovery company added that he was unable to rotate the propeller, possibly due to corrosion. The pilot further stated that he used REC-90, a 90 octane, ethanol free gasoline in the airplane and stored the gasoline in his hangar. After every flight, he completely fueled the airplane from the gasoline storage to prevent condensation from accumulating in the fuel tanks. Prior to the accident flight, he last flew the airplane on September 11, 2017, for .6 hours and added 6 gallons of gasoline after he landed. He also inspected the fuel tanks during the preflight inspection for the accident flight, and both fuel tanks were full. He recalled being burned from fuel in the water and noted that a recovery diver made the same comment. The pilot subsequently provided a receipt indicating that he most recently purchased 30 gallons of REC-90 on September 5, 2017. Initial examination of the wreckage by a Federal Aviation Administration inspector revealed that the fuselage was buckled during the ditching. The inspector further examined the wreckage at a recovery facility and specifically examined the engine driven fuel pump as the pilot thought that the pump might have failed. The engine driven fuel pump drive shaft remained intact. The inspector was able to actuate the pump by hand and did not note any anomalies with the pump. Due to extensive corrosion damage, the inspector was unable to rotate the engine crankshaft. The four-seat, low-wing, retractable tricycle-gear airplane, serial number D-623, was manufactured in 1947. It was powered by a Continental E185, 185-horsepower engine, equipped with a constant-speed, two-blade Hartzell propeller. The airplane's most recent annual inspection was completed on April 27, 2017. At that time, the airframe had accumulated 3,768.4 hours of operation and the engine had accumulated 72 hours since major overhaul. The airplane had flown about 35 hours, from the time of the most recent annual inspection, until the accident. On September 16, 2017, about 0855 eastern daylight time, a Beech 35, N3187V, operated by the private pilot, was substantially damaged while ditching in the Gulf of Mexico, following a total loss of engine power about 10 miles west of Marathon, Florida. The private pilot and passenger were not injured. The personal flight was conducted under the provisions of 14 Code of Federal Regulations Part 91. Visual meteorological conditions prevailed and no flight plan was filed for the flight that originated from Fort Lauderdale Executive Airport (FXE), Fort Lauderdale, Florida, about 0745. The pilot reported that he and a business partner planned to survey damage to his business partner's home on No Name Key, Florida. They flew to the home, circled it at a lower altitude, took photographs, and began a climb back to cruise altitude for the return to FXE. About 800 to 1,000 feet above mean sea level, the engine lost all power. The pilot prepared to ditch as the airplane would not glide far enough to reach land. He also attempted two engine restarts with no success, and reported the emergency to air traffic control. The pilot attempted two more engine restarts using the wobble fuel pump and electric fuel pump. He then attempted another restart using the electric fuel pump with no success. The pilot landed on the water with the landing gear and flaps retracted. The airplane came to rest upright and both occupants were rescued by law enforcement. According to the president of a recovery company, the airplane was recovered 12 days later, on September 28, 2017. The airplane appeared to be intact and was resting on a sandy bottom. Following recovery, no fuel or water was noted in the left wing fuel tank and approximately 1 gallon of a fuel and water mixture was recovered from the right wing fuel tank. Initial examination of the wreckage revealed that the fuselage was buckled during the ditching. The wreckage was retained for further examination. Folks, water will get into the tank and float nearly every drop of fuel out of the vents over a period of days. Same happens with lawn mowers, etc that have exposed vents like airplanes when these submerge in a flood. Not so much with cars as modern tanks are not vented the same way. I once had an unsecured 5 gal Evinrude fuel tank inside a boat that sank due to a broken fitting. I refloated the boat a day later and pleasantly found the tank inverted and floating (heaviest parts normally on top) and there was no fuel leak at all. All the fuel was still inside and trapped upward inside the inverted tank. A good design! Good outcome in a dicey situation! Pilot got thru his restart checklists quickly and still managed to stay ahead of a fast plane at low altitude with a big sink rate to get it stopped right side up with no injuries. Odds were against them landing a low wing on the water. Even got an interesting photo out of the experience.